Convenient ways of payment for parking in cash and via credit card. Revitalization of the surfaces and signage in the PALLADIUM parking garage is nowadays in process. You can continue to park there without interruption, as only limited parts of the garage are being repaired at any one time. The hand car wash service is operating normally. ​Upgrade your parking ticket for unlimited number of entries and exits. IN EUROS (IN CASH OR BY CARD). What is the hourly parking rate? The rate for the first hour, and each subsequent hour, is 55 CZK. Can I reserve a parking space in advance? The reservation of a parking space in advance is not possible. The garage has 900 parking spaces on three underground floors. In which time period is the PALLADIUM underground garage accessible? The PALLADIUM underground garage is accessible 24 hours a day, 7 days a week. 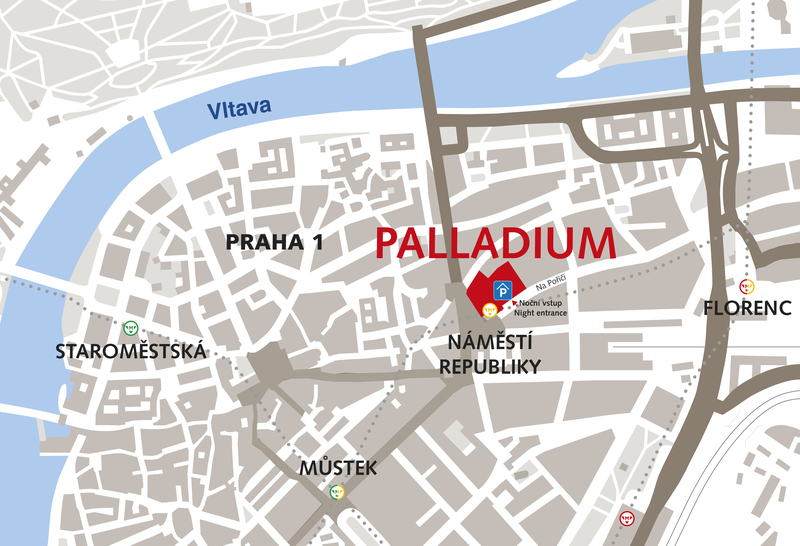 The night entrance into the garage is through the office entrance at Na Poříčí street between 3 and 7 a.m.
Where is the night entrance located? Between 3 and 7 a.m. you can get to the underground garage through a night entrance which is located at the office entrance from Na Poříčí street (see the map). To open the entrance gate you must scan the bar code on the parking coupon on the right side of the entrance gate. Then you go through the entrance courtyard to the back right corner and use the glass door which you can open by scanning the bar code on your parking coupon. Inside, use the elevator which will take you the relevant underground floor where you have your car parked. Do you offer discounted rates for one day or several days parking? Yes, the parking rate for a whole day (i.e. 24 hours) is 700 CZK, the parking rate for three days (i.e. 72 hours) is 1,800 CZK. If I pay for the parking in advance for a certain period of time, what will happen if I exceed the prepaid time? In this case contact the Parking Office (you can find it by the entrance gate) where you will pay in cash the amount for the exceeded time according to the valid pricelist. If I exceed the prepaid parking time, will my car be towed? No, your car will not be towed. However, you can exit the garage only after paying for the excess time according to the valid pricelist. The payment must be in cash in the Parking office (you can find it by the entrance gate). Can I repeatedly enter and exit the underground garage if I want to use a one day or three day parking rate? No, this is not possible. In this case you can use the „Parking coupon upgrade“ service. What does „Parking coupon upgrade“ service mean? Thanks to this service you can make your parking coupon a coupon with unlimited number of entries and exits into and out of the PALLADIUM garage during 1 or 3 days. What should I do if I want to use the „Parking coupon upgrade“ service? I need to park in PALLADIUM in a certain period of time with an unlimited number of entries and exits into and out of the garage. What should I do? Send your demand via e-mail to parking@pmsolutions.cz. You will get an offer within 1 working day. Can I reserve a parking space on www.bezpecneparkovani.cz? No, the reservation of a parking space on www.bezpecneparkovani.cz is not available anymore. Is the underground garage guarded? The underground garage is not guarded, but is secured by a 24 hour security camera system. Is there a hotline available in case of any problems during parking? There is a permanent, i.e. 24 hours, Parking Office staff at your service (you can find it by the entrance gate). If there is nobody available in person please contact the staff via phone, the telephone contact is on the entrance doors of the Parking Office.